If you are anything like us at Large Cabin Rentals in Pigeon Forge, then you believe that family is one of the most important things anyone can have. That is why we think it is equally important for people to have the opportunity to keep in touch with their beloved family members by helping our guests plan the perfect family reunion in a large Pigeon Forge cabin rentals. The first step is to decide what kind of family reunion you want to have inside your large Pigeon Forge cabin rental. Do you want to invite just the family members that live a short drive away, or are you looking forward to spending time with all of your family? Once you have narrowed down your guest list, then you can start to look at what size cabin you will need to rent, and what activities you will want to plan. So you have your guest list written out, but now you have to decide when you want to have your family reunion in a large Pigeon Forge cabin rental. At Large Cabin Rentals, there isn’t really a season in the Smoky Mountains that we don’t love. Fall is really pretty because the weather is a little cooler, and you get to witness the majestic views that occur when the leaves in the Great Smoky Mountains National Park begin to change. Ok, you have your guest list and when you want to come. Here is the fun part! 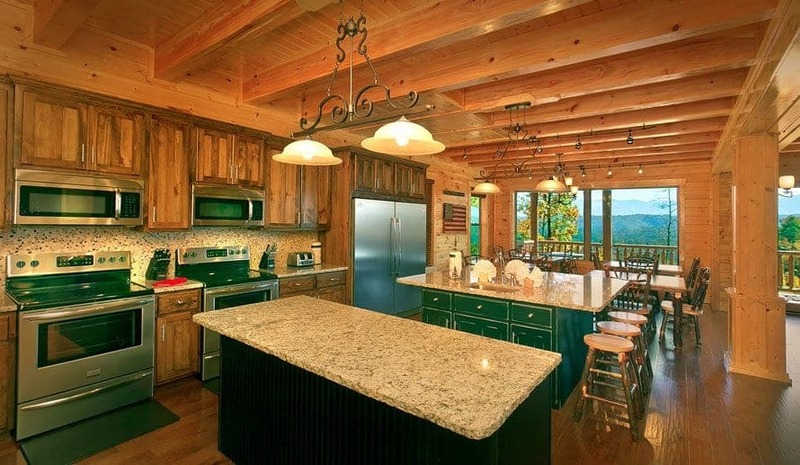 Now you get to scroll through all of the luxurious, custom-built large cabin rentals in Pigeon Forge offered by Large Cabin Rentals to find which unit will meet your family’s needs. Our rentals range in size from 8 bedroom cabins in Pigeon Forge, all the way up to an astonishing 16 bedroom cabin. The perk of having such a wide variety is that we are able to accommodate any size group looking to enjoy a family reunion in the Smoky Mountains. Click here to learn more about the fine amenities that can only be found inside our large cabin rentals in Pigeon Forge. Looking for an easy way to keep all of your family members in the loop on what you are planning for your family reunion in a large cabin rental in Pigeon Forge? An easy way to do this is to create a Facebook page or a reunion site where members can see all the plans that have been finalized, connect with other members that will be attending, and find all the latest information on what you have planned. Another benefit to this is that the other members can offer input and suggestions, so you won’t have to do all of the planning on your own. One of the biggest reasons for having a Smoky Mountain family reunion is so that you and your family members can create long-lasting memories. What better way to capture these special moments than by remembering to take pictures? If you don’t want to be stuck behind a camera the whole time, a good trick is to have everyone bring their own digital camera and set them out throughout the large cabin rental in Pigeon Forge and allow everyone to take pictures as they go. To keep track of which camera belongs to who, you can write their name on a piece of tape, or take a picture of the owner as the first picture on the memory card. An added bonus of having digital copies of all of your photos from your family reunion in a large Pigeon Forge cabin rental is that you can easily share them among the group with just the click of a mouse on the computer. Besides, remember that Facebook group you made to help plan the reunion, you can now use it as a place to reminisce of all the fun times you had in the Smoky Mountains and share your photos there. Now that you have gotten all the work of planning your family reunion in a large Pigeon Forge cabin rental out of the way, it is time to sit back and relax while you enjoy spending time with your family. Your hard work will now be paid off. The Big Moose Lodge is a 16 bedroom cabin in Pigeon Forge that can sleep up to 74 guests under the same roof. That’s a lot of family members! Here, guests will find 14 kind bedrooms, 3 full bunks and 3 twin bunk beds, as well as a fully-equipped double kitchen, movie theater room, in-cabin laundry facilities, pool table, two outdoor hot tubs, and unbeatable scenic views of Mount Leconte. For a sneak peek on the inside of The Big Moose Lodge, be sure to check out the video below! Ready to begin planning your next family reunion in a large Pigeon Forge cabin rental today? Give us a call at (877) 544-9594. A member of our reservation team will be more than happy to help answer any and all questions you may have. See you in the Smokies!